‘Wow.’ Is what I have to say about our evening at Terre a Terre. It’s been a dream for me to visit here for a long time, since I have been in Brighton in fact, and I was lucky enough to be invited along one Thursday evening to check out what they have to offer that is gluten free. 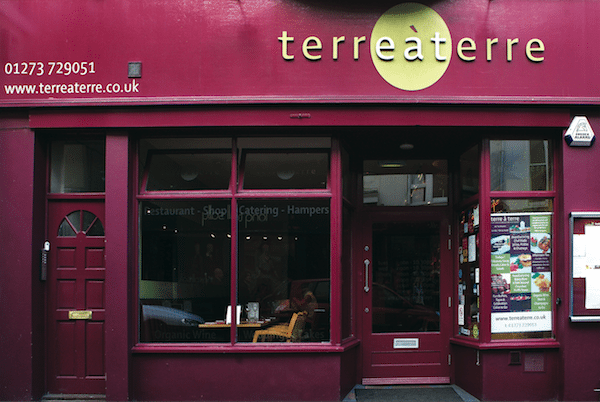 Terre a Terre is a vegetarian restaurant located in central Brighton in The Lanes. It begun as a BYO restaurant in 1993, opened by two classically trained chefs who had worked their way around the world who shared a passion for meat free cuisine. They soon made a name for themselves and are now nationally recognised, for serving gourmet, exquisite vegetarian, vegan and no gluten containing ingredients food, and offer diners a casual, but also formal dining experience, to suit whichever occasion or experience. It was a weeknight when we visited and the place was humming, we arrived around 6:30 and it was filling up quickly. There is a sign at the front which says ‘wait here and we fill find you’ so we did, and sure enough we were found shortly after and taken to our table. Our waitress kindly took our coats (we had lots of layers on as it was nasty outside) and we were offered still, sparkling or tap water and given menus to look through. The menu is large, with loads to offer and I found myself overwhelmed with choice! There are a range of nibbles, starters, plates to accompany, mains and sides. It is clearly labelled to help dietary requirements, with V for vegan, VC for vegan choice, and NG and NGC labelled for ‘no ingredients containing gluten’ or ‘no ingredients containing gluten choice’, so you will know straight away what you can and cannot eat. I noticed in the starters they had a Terre a Terre tapas tasting plate, so I asked the wait staff what was included. It’s basically a whole lot of mini dishes from around the menu so was perfect for us as we were able to try nearly everything that we wanted! This is able to be adapted to be gluten free friendly so we were told it would be slightly different than the regular version. We ordered a plate to share along with a main each. I reeeaally wanted to try their truffle fries with truffle mornay sauce and quail egg mimosa, but my partner stopped me as I knew that we would have a lot of food already. I guess we just have to go back! Oh, and I nearly forgot – the drinks! This was an exciting part of my evening, as they have a gluten free beer available that was absolutely delicious. 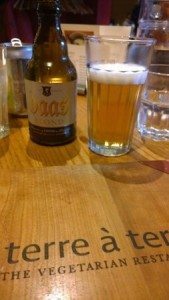 If you have read any of my other reviews you would know that I do like beer and it’s something that I miss dearly, so finding a gluten free beer and one that is good is really exciting for me. 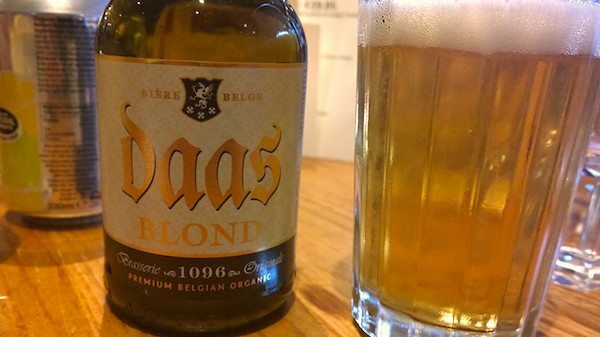 It was a Daas blond beer from Belgium, organic and very lovely. It was smooth, sweet and lightly hopped, and I would love to drink more of these in the summer months soon. I have tried many gluten free beers now, and they seem to be getting more and more delicious! 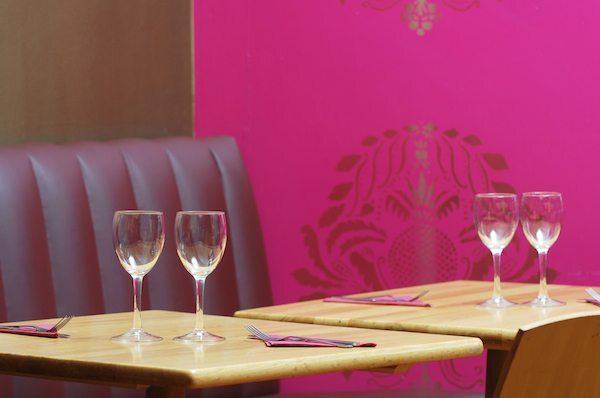 The restaurant was getting busier and busier but the staff were very efficient and coping very well. Our water was constantly topped up, and it was lovely sitting amongst other diners who all we could hear was them saying excellent things about their food. Our tapas plate arrived and looked stunning. It was presented beautifully, and looked very appealing, it reminded me of a garden with many different components to it I was frantically trying to write notes so I reminded what we ate! The plate was divided into two, so we had our own side of the plate each which I liked (as I don’t do well with sharing). 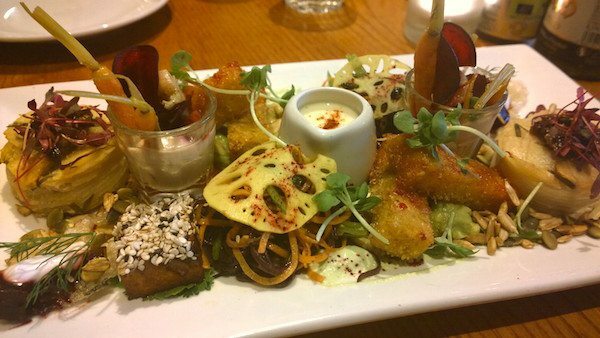 The plate included a shallot puree with pickled veg; tapioca crisp with beetroot and creme fraiche; dauphinoise potatoes; marinated tofu; polenta (arepa) fingers with sweet chilli sauce that sat atop smashed avocado with a cheese fondue for dipping; toasted tamari sunflower seeds; crunchy cashews; seaweed, black rice soba and spiralized veg salad and sesame; and a pickled lotus root. It was super creative, and each component was cooked excellently. The shallot puree was smooth and creamy, and went well with the sharp contrast of the baby pickled veg for dipping. The arepa fingers were crunchy on the outside, and had cumin or caraway seeds mixed through for flavour, and the smashed avocado had a little kick to it and seasoned well with lemon, salt and pepper. The cheese fondue was delicious, the dauphinoise were firm to bite, but tasty, and the tamari sunflower seeds and cashews added a nice crunch to the plate. I loved the crispy tapioca crisps with the contrast of the soft, earthy beetroot on top, along with the cooling creme fraiche and a tiny sprig of dill that was a perfectly balanced morsel of food. The tofu was well pressed so not soggy, and had a lovely tamari soy marinade and coated with sesame seeds. One of my favourites on the platter was the soba noodle salad – it was fresh, nicely textured, and had black sesame seeds to add extra flavour. Our waiter said it used to be a main dish served with the marinated tofu once upon a time, and it has been a staff favourite for years. I see that they also share good taste with me! We were really impressed with our food so far, and the friendly, helpful and professional service had been given. Everyone seemed so happy to be working there, and obviously really passionate about the food they were serving. We didn’t have to wait long for our mains, but while we did we checked out the small cards on the centre of the table. They have a card on the table with an order form so you can take home treats such as truffles or chutneys home as a gift or for your own use. They were also advertising their high tea (which you can also pre order gluten free) and their Terre a Verre menu which includes a tapas tasting plate with chunky chips and a 500ml carafe of wine for £39.95 – a perfect introduction to the restaurant, and great for a post shopping light meal, (or pre shopping if you prefer!) This is not available on Friday and Saturday evenings though so do keep it in mind, but it is definitely something I will be coming back for! Our mains were placed in front of us and looked wonderful. I had order one of their famous rostis, while my partner chose the ‘Easy Peasy Calabrese’ which I’ll describe shortly. 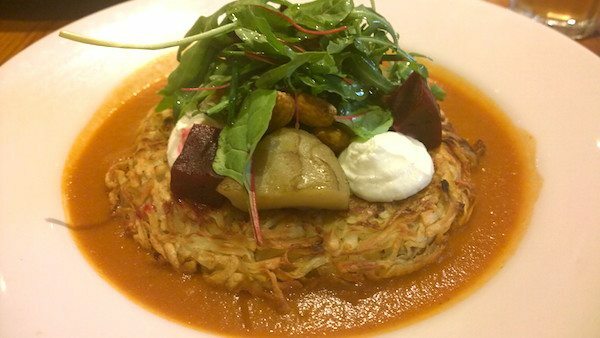 My rosti was crunchy on the outside, and still had defined gratings of potato, so it was well textured and not too mushy. It was topped with artichoke hearts (my favourite), goats cheese, rocket, and surrounded by a moat of roasted tomato sauce. It was really rich, but I managed to just finish it all, while sharing (reluctantly) with my partner as well. My partners dish looked great – there was a filo parcel filled with caponata – a mixture of olives, tomatoes, aubergine and oregano, there was a whole stem of roasted broccoli, olives, a spinach sauce that was full of flavour, and a crispy deep fried croquette that he just described as awesome. 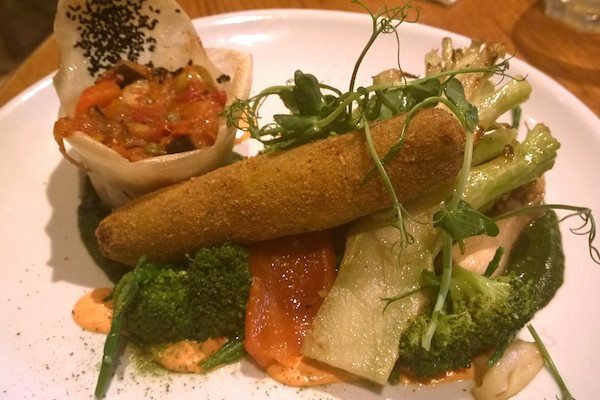 His dish wasn’t gluten free, as it had the pastry and bread crumb croquette, but there are plenty of other delicious mains to choose from so don’t you worry! We were now absolutely stuffed, but of course I was intrigued by dessert. There were several gluten free options to choose from, and we decided to go for the most interesting sounding one there was. It was called a kulfi cone served with passionfruit and pomegranate and it was really interesting! Kulfi is an Indian style ice cream, that is really thick and creamy, and this particular kulfi was flavoured with mango, so it was fruity and sweet. 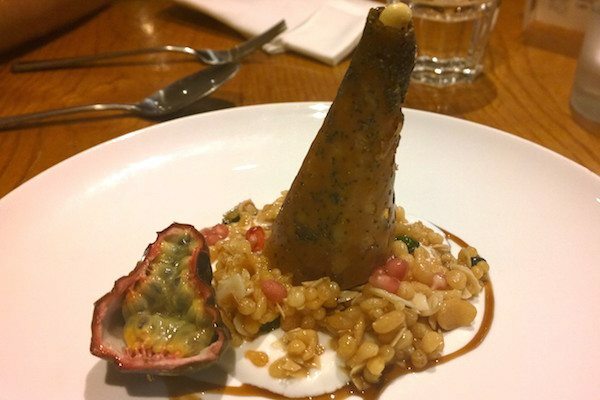 Around the kulfi was a thick blanket of caramel flecked with poppy seeds in the shape of a cone, and there was puffed rice, almonds and pomegranate seeds scattered around the base. It was a nice and sweet dessert to finish the meal. Eating out gluten free is easy at Terre a Terre, as everything is clearly labelled and the staff are super knowledgable too. It really is somewhere that aim to have something for everything, even meat eaters, as there was not one point of the meal where I thought my plate was missing meat! Everything was cooked with creativity and care, and everyone should experience Terre a Terre if they haven’t already. It’s very reasonably priced for the quality of the ingredients, and the portions are huge! I can’t see you leaving there hungry.